Traveling has always been a great educator for me and a recent visit to the east coast of Florida proved once again that there is always something new to be learned no matter where your travels take you. We were fortunate recently to spend a few days in a part of Florida that we had not visited before, Vero Beach. 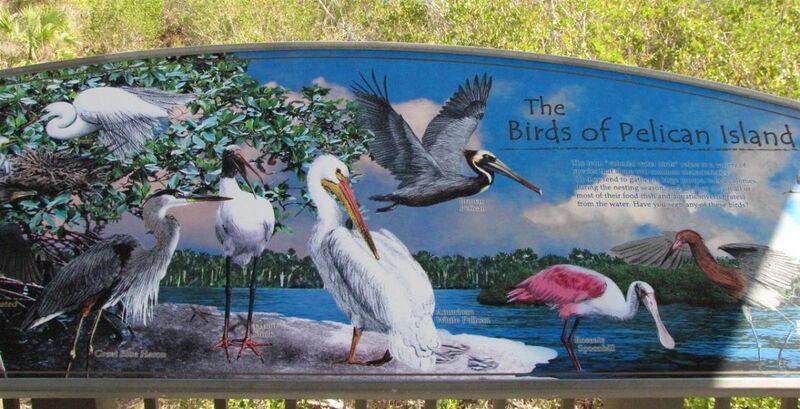 For those of you who love the great outdoors and are familiar with this area of Florida you may know that the National Wildlife Refuge System all started here in 1903, when President Theodore Roosevelt set aside the tiny 5.5-acre Pelican Island as the country’s first federal bird reservation, forerunner to the National Wildlife Refuge System. 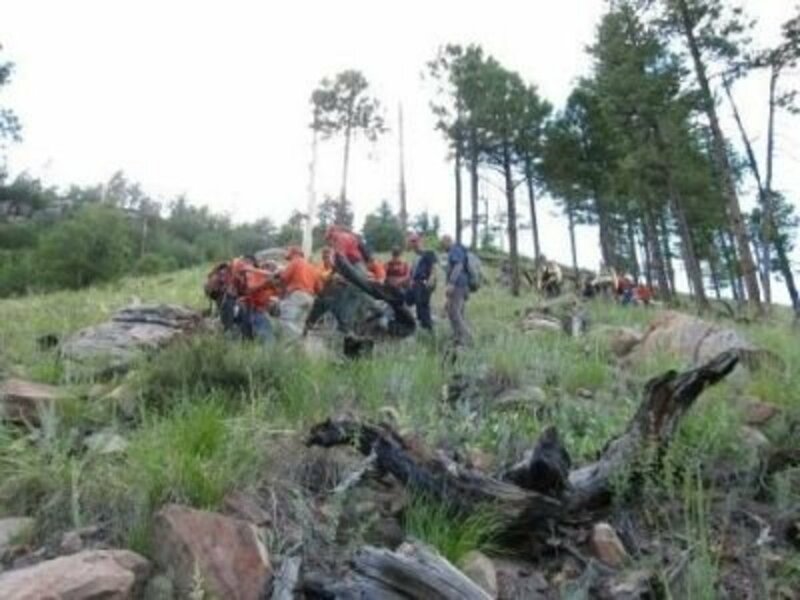 Thus began a movement that would spread across the country and today encompasses over 560 wildlife refuge areas protecting over 150 million acres. Upwards of fifty million visitors annually are now able to enjoy these protected areas where they can see wildlife in its natural habitat. The existence of the Pelican Island NWR owes a great debt of gratitude to a gentlemen by the name of Paul Kroegel. Kroegel lived on the West Bank of the Indian River within eyesight of Pelican Island during the late 19th century. Kroegel made it his personal responsibility to protect the birds of the island who were hunted for their feathers. At great risk to his personal safety, Kroegel would take his boat and his shotgun out to the island to protect the birds. Eventually Kroegel was hired by the Florida Audubon Society to protect the island and after President Roosevelt created federal protection for the land, Kroegel was hired as the very first manager of a National Wildlife Refuge. 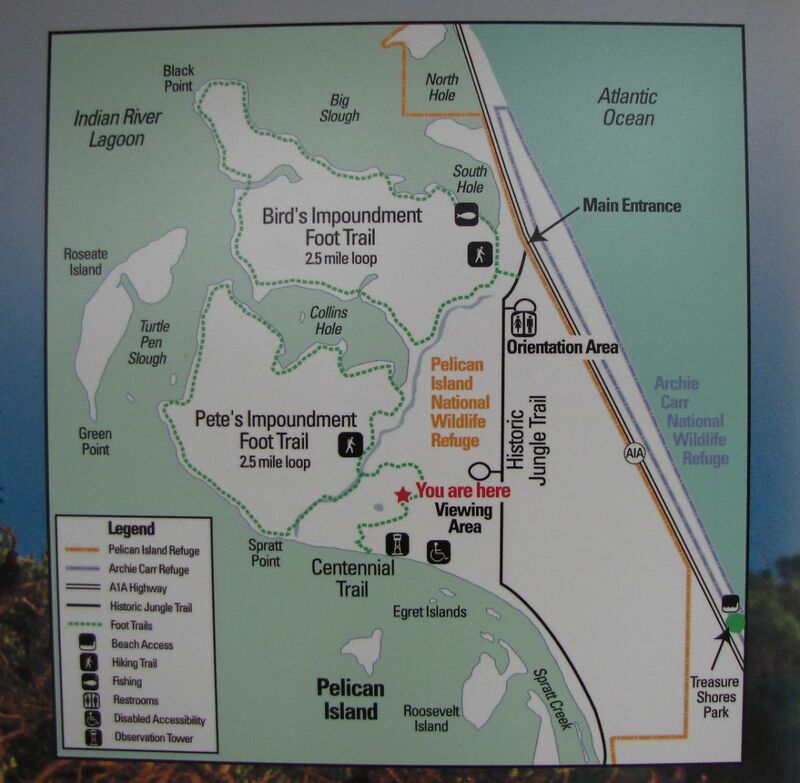 The Pelican Island National Wildlife Refuge is located just off of route 1A1 approximately three miles south of Sebastian Inlet in what is known as the Indian River Lagoon. The public use area of the refuge has expanded to over 5,400 acres and is located on the Historic Jungle Trail, which is actually a packed dirt/sand road that was constructed in the 1920s for the citrus industry to transport fruit. 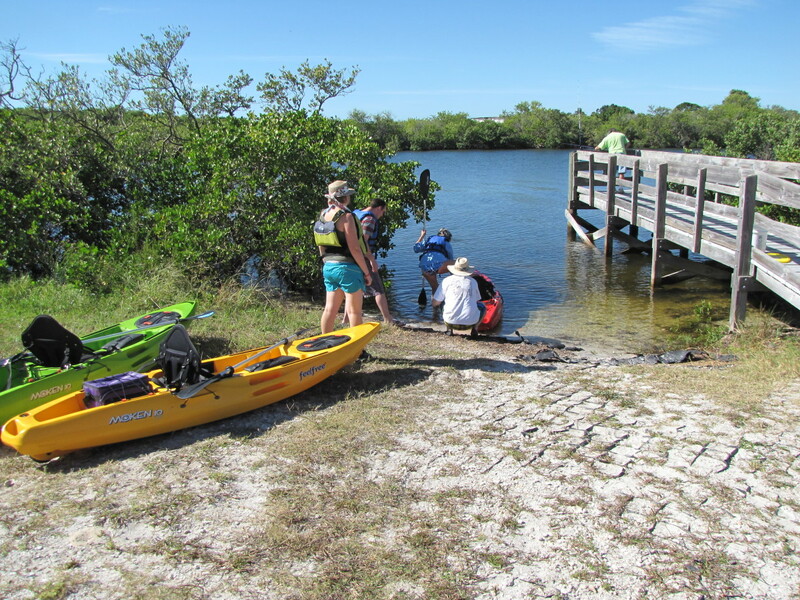 The Jungle Trail runs for nearly eight miles along the Indian River and offers spectacular coastal scenery for those looking to walk, run, bike, or drive the trail. Don't worry, it is well maintained and easy to travel on. 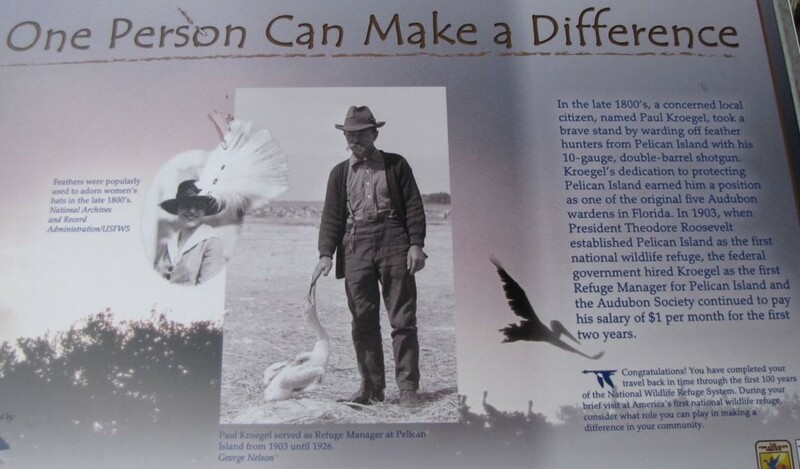 Were you aware that the National Wildlife Refuge System all began here at Pelican Island? 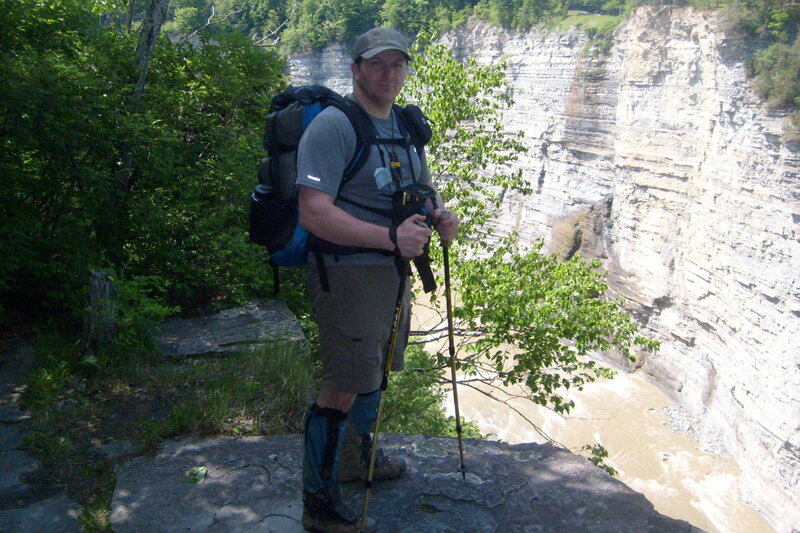 The wildlife refuge has three main hiking trails totaling about seven miles. 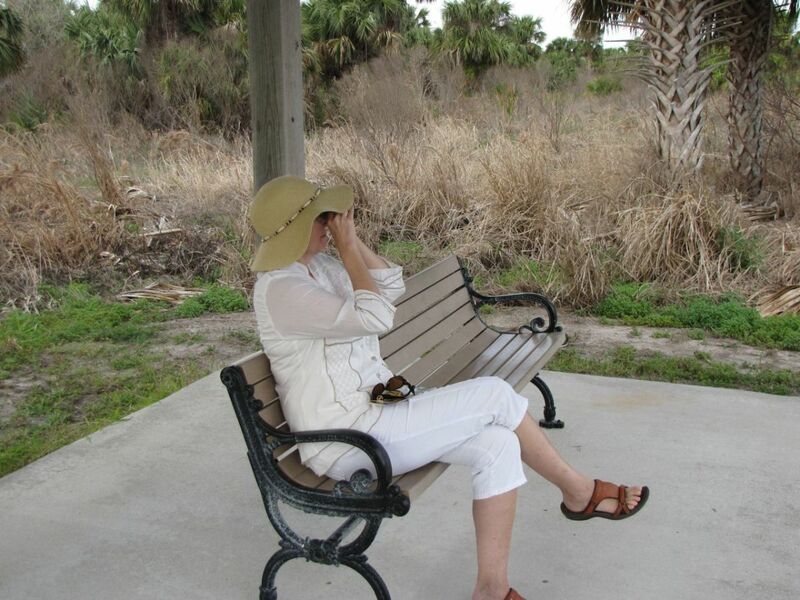 For our visit we decided on the Centennial Trail, which takes visitors to the Pelican Island observation tower. 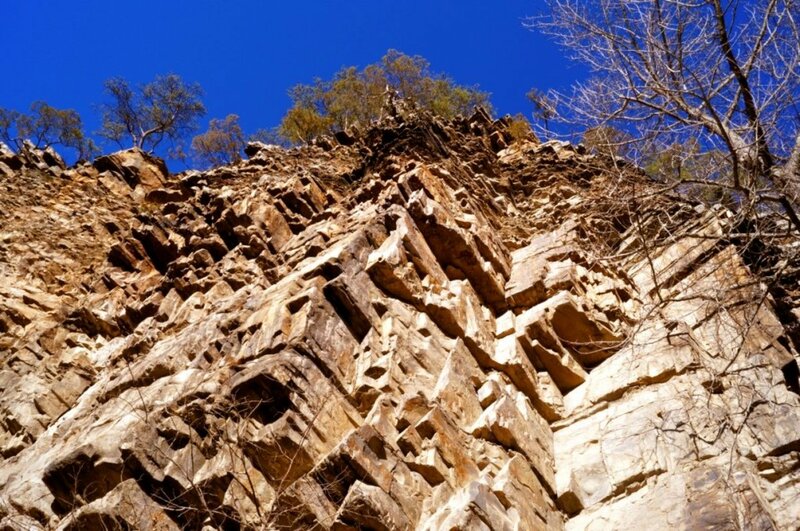 This is the shortest of the three trails, approximately ¾-mile roundtrip, but offers visitors a rather interesting and pleasant surprise. 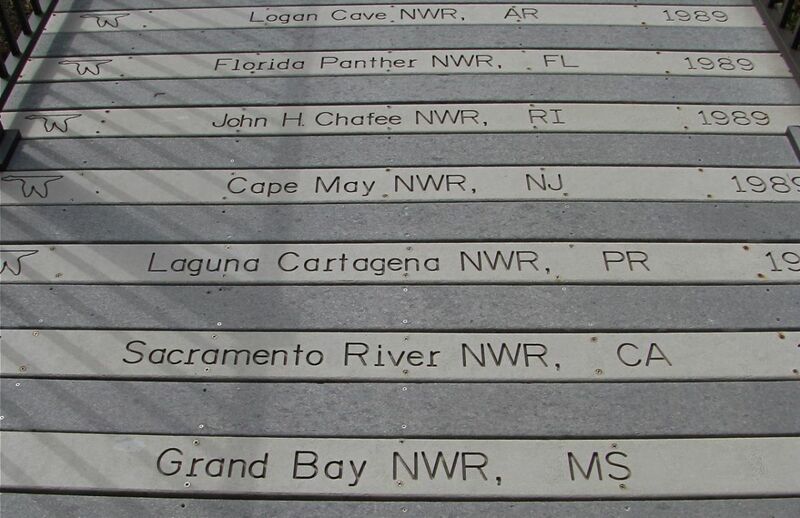 The raised boardwalk section of the trail contains over 560 engraved planks, each containing the name of a National Wildlife Refuge. Each plank contains the refuge name, state, and the year it was established. 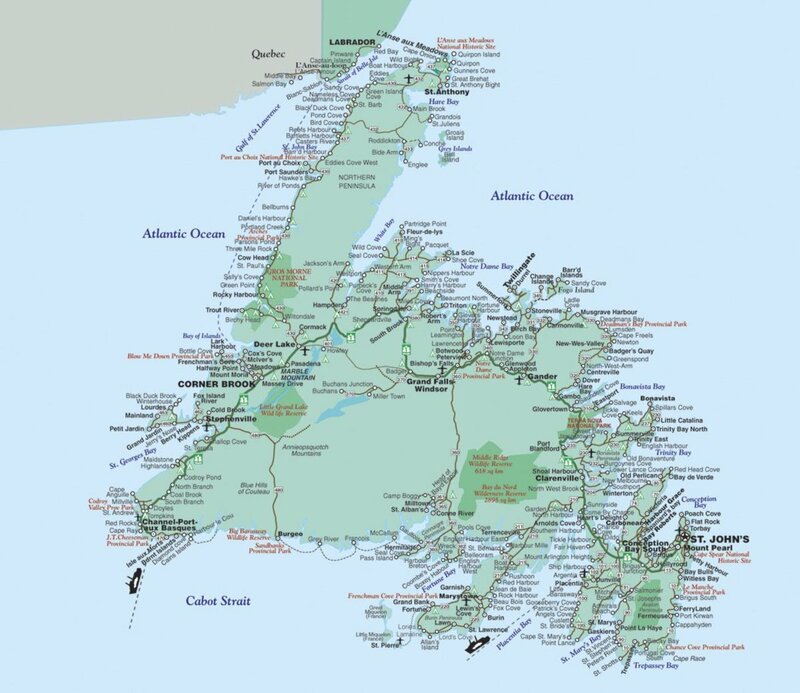 It was great fun identifying the refuge areas that we have visited and discovering that there are actually a few in our home state that we have never heard of. 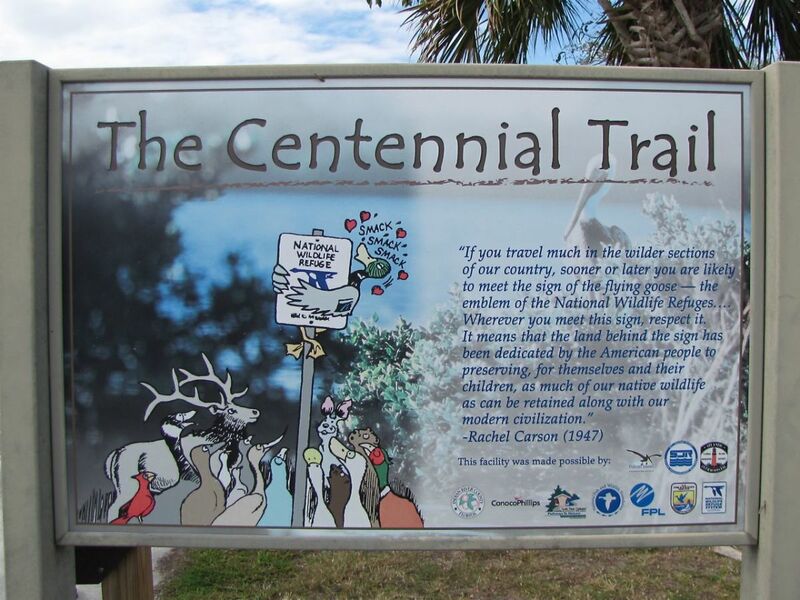 The boardwalk was opened in 2003 to mark the 100-year anniversary of the establishment of the National Wildlife Refuge System, hence the name Centennial Trail. It was quite the education. Prior to reaching the boardwalk section of the trail you will pass the butterfly garden and a fresh water pond that is a great spot to observe birds and the local water fowl of the area. 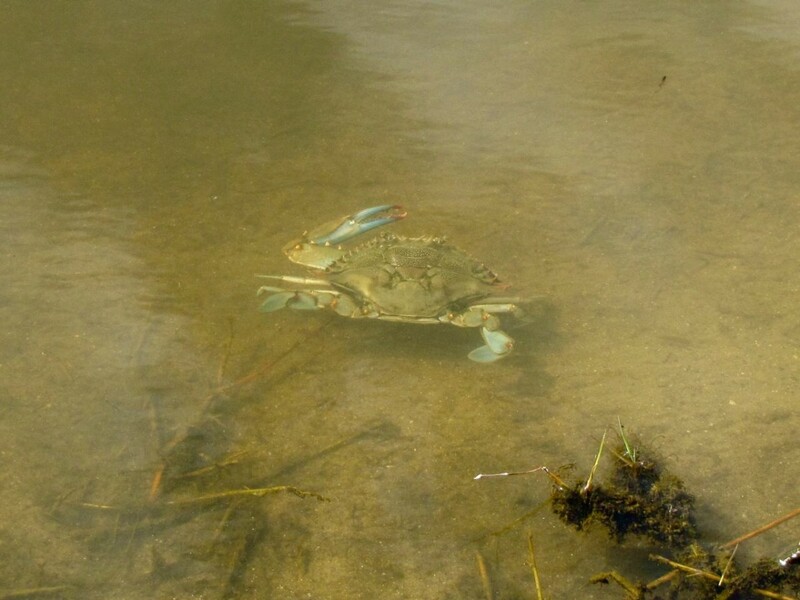 While checking out the pond we were fortunate to see a number of blue crabs in the water and amazingly they seemed to respond to our presence, maybe they were expecting to be fed? The pond is also home to turtles, fish, snakes and a lot of local birds looking for a meal. 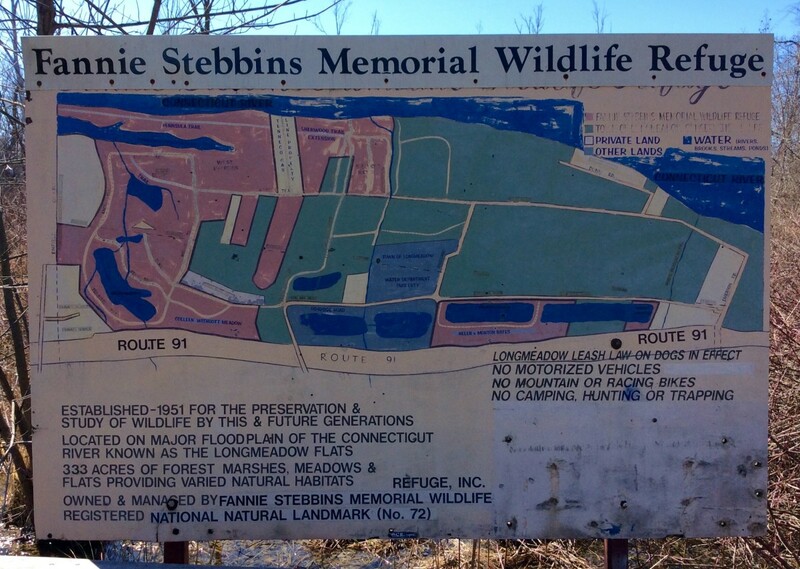 As you walk the trail you will pass a number of interpretative panels to help educate visitors on the refuge and the wildlife that call this area home. There are also some well placed benches along the trail so you can sit and watch the wildlife. The trail around the pond will lead you to the raised boardwalk section with the NWR planks and eventually this will take you to the observation tower that looks out to Pelican Island. 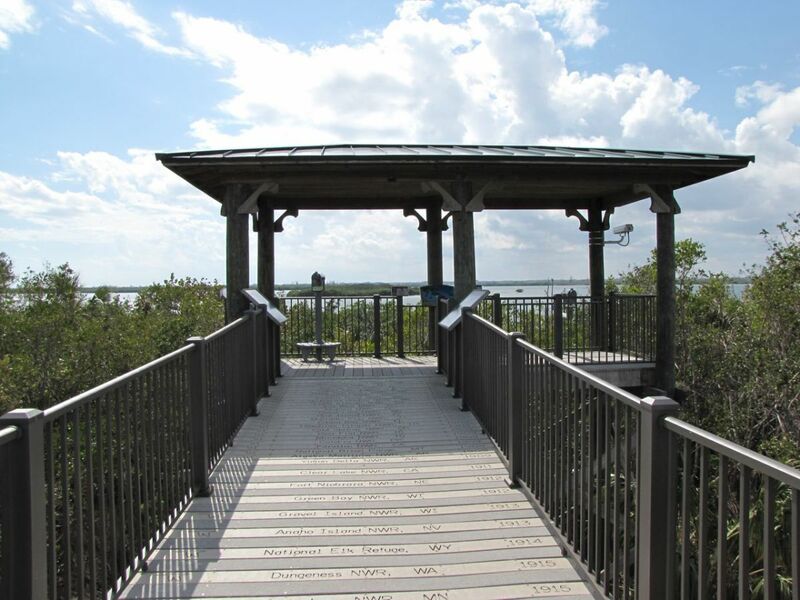 The Centennial Trail ends at the elevated observation tower in the photo above and it provides a great view of Pelican Island and the Indian River Lagoon. 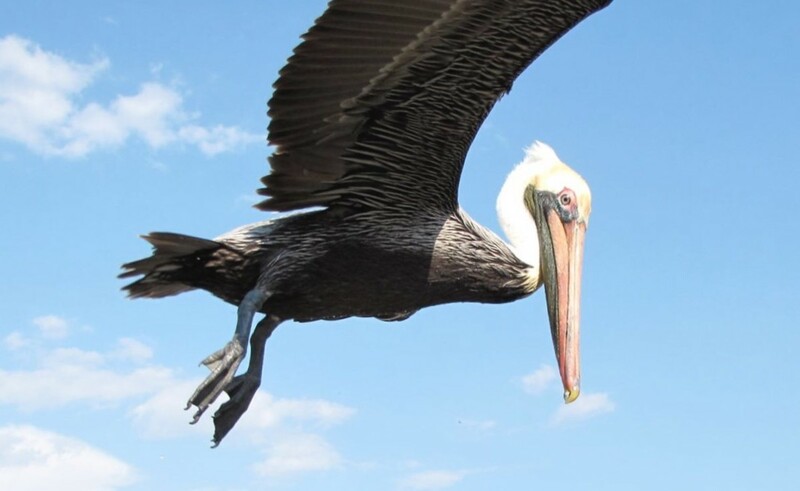 The island is one of the last Brown Pelican rookeries on the east coast and offers a prime nesting area for a number of Florida birds including brown pelicans, egrets, blue heron, ibis, anhinga, cormorant, and wood storks. During the migratory season, which is November through March, you can expect to have several thousand birds roosting on this one tiny island. 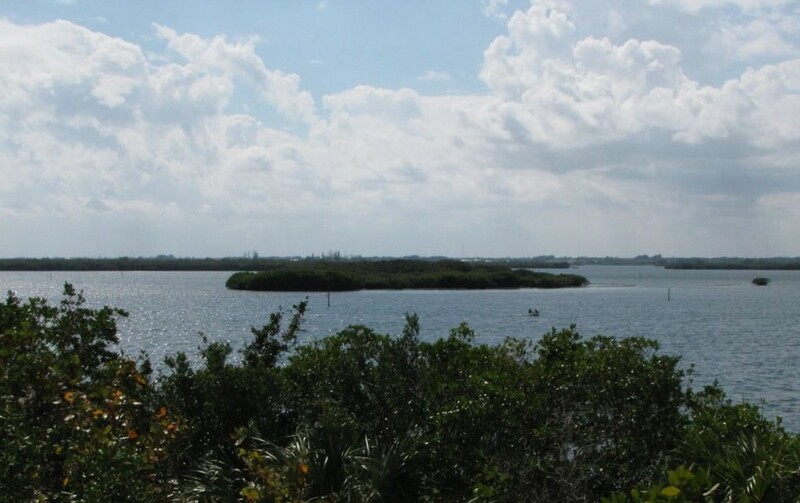 While at the observation tower be sure to utilize the two spotting scopes that both work very well and give visitors an up close look at Pelican Island and some of the other surrounding islands. I would certainly suggest bringing binoculars if you have them. 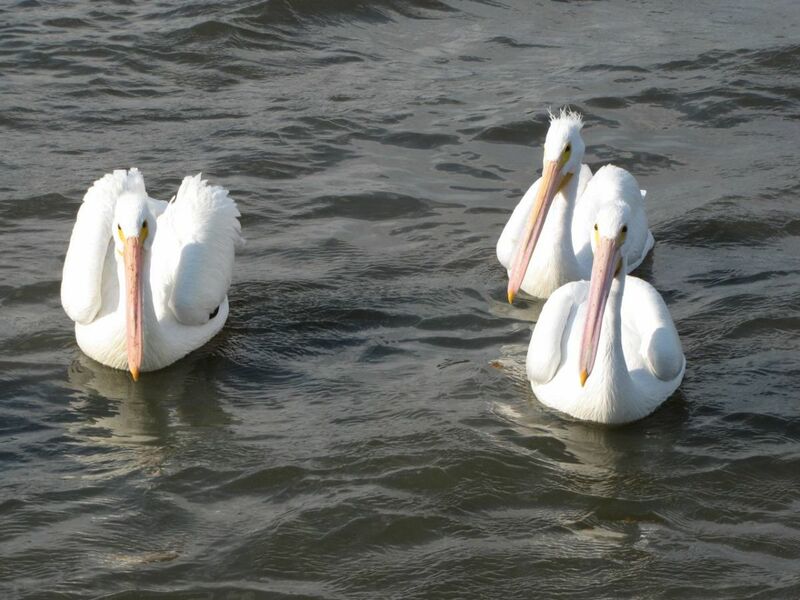 If you are visiting during the fall to early spring you may also see the beautiful white pelicans that visit this area. 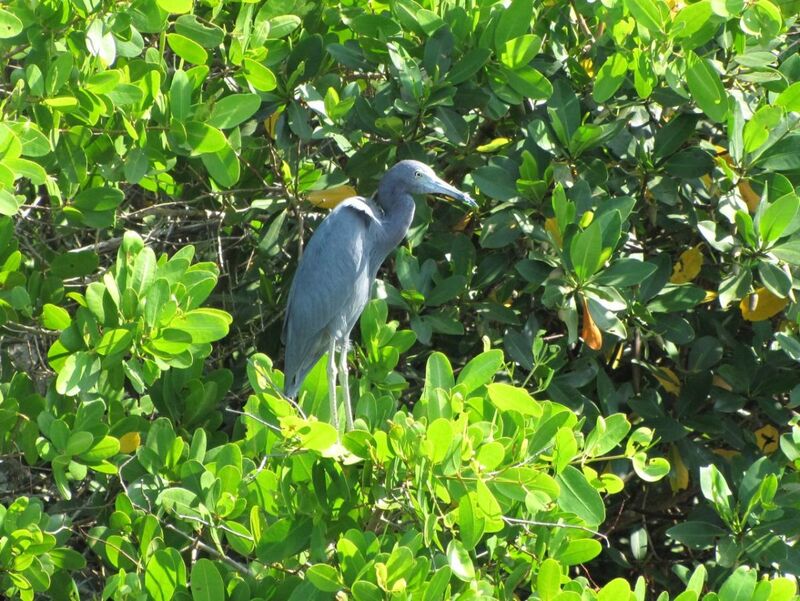 If you would like to join in on a free wildlife tour while visiting the Pelican Island National Wildlife Refuge you can schedule one by calling 772-581-5557, extension-2. Tours are conducted by volunteers on Wednesdays from 8 am to 10 am, and run from November through March. A reservation is required and this is a great way to learn about the refuge from a knowledgeable guide. I hope you enjoyed this visit to our nations very first National Wildlife Refuge. 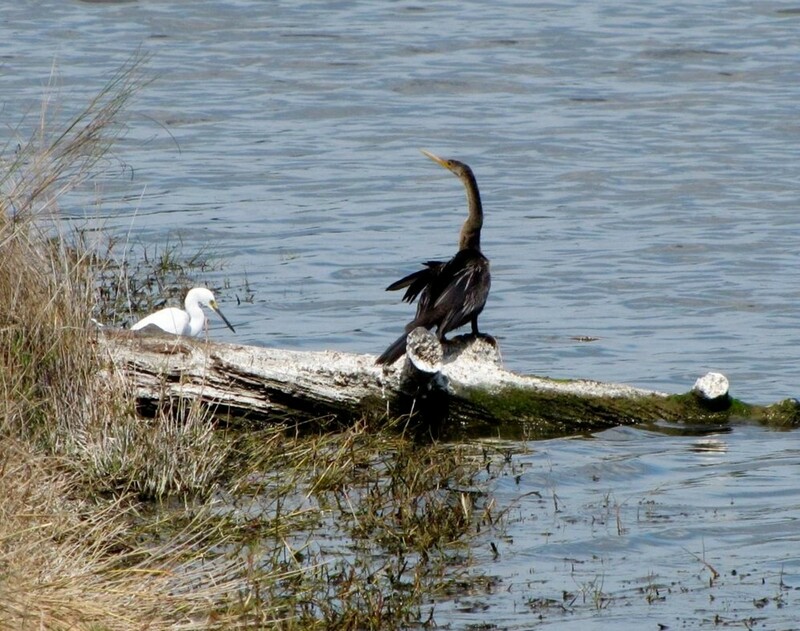 Pelican Island is certainly one of the most historically important wildlife sites in the United States and paved the way for a system of protected refuge areas that everyone can visit and enjoy. Thank you Flourish. I can only sit on a beach for so long so we always go looking for other interesting things to see and do. Hope your daughter has an enjoyable trip. I'm back to bookmark this, as my daughter wants to return to the beautiful Vero Beach area. I like to find other things to do than surf and sand, and this is lovely. Thanks Alun. This was an area of Florida that we had not visited before and I was not familiar with Pelican Island prior to our visit. Turned out to be an amazing place with incredible wildlife. 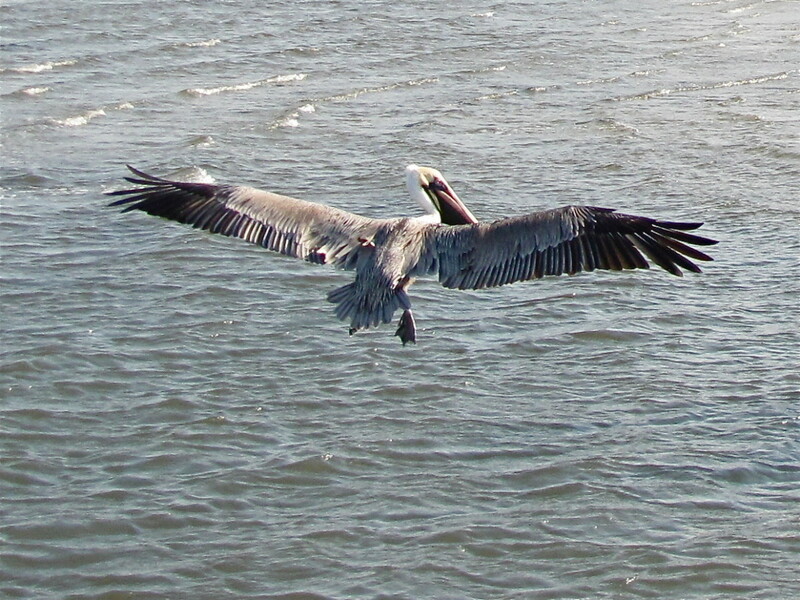 The pelicans are like lumbering jumbo jets when they take off and not difficult to photograph. 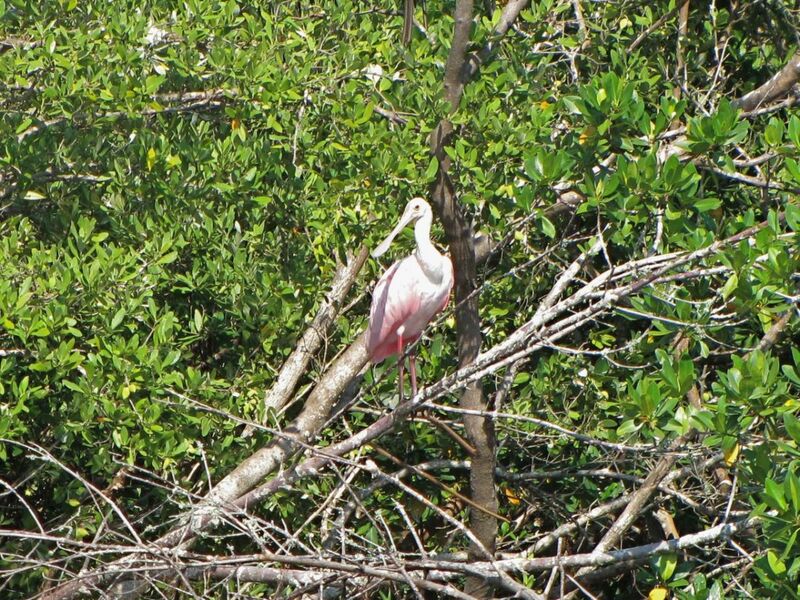 We have seen a Rosetta Spoonbill on a few ocassions in Florida and it's always a highlight. Thanks as always for stopping by. Have a great weekend. Good hub Bill, and good photos too - especially the two of the pelicans in flight. They may not be the most difficult birds to photograph, but these are pin sharp. I particularly like the opening photo. And you snapped a roseate spoonbill - I visited Florida once in the 80's and a few times in the 90's, but I never saw one of these in the wild. My visits were mainly to the Gulf Coast, but I'm well aware from my visits there just how well maintained and informatively signposted many of these nature reserves and trails are, and the boardwalk trails in particular are a great way of enabling the public to get up close to wildlife with minimal disturbance. Hi Heidi. Thank you. 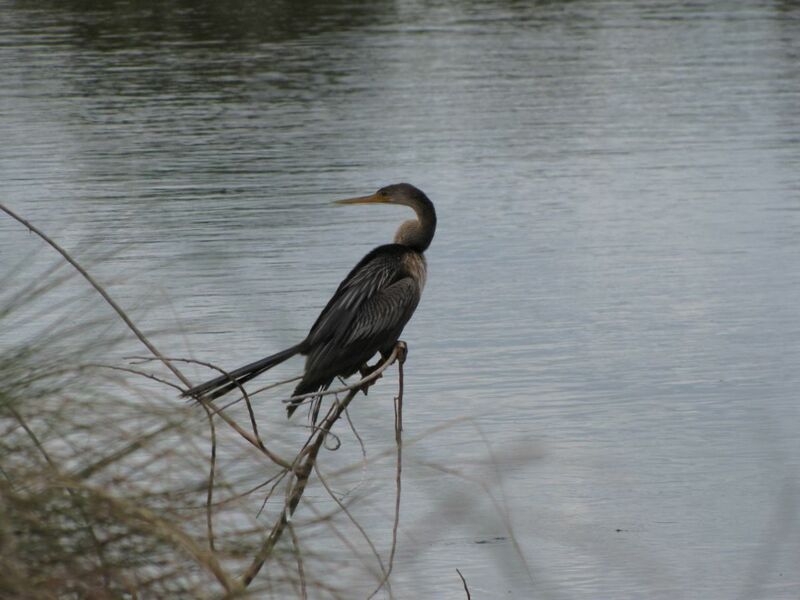 This particular park, Pelican Island NWR, is teeming with wildlife. And the beaches here are beautiful. We usually make it to Florida at least once every winter so I'm sure we'll have an opportunity to return. Thanks so much for stopping by, have a great week. 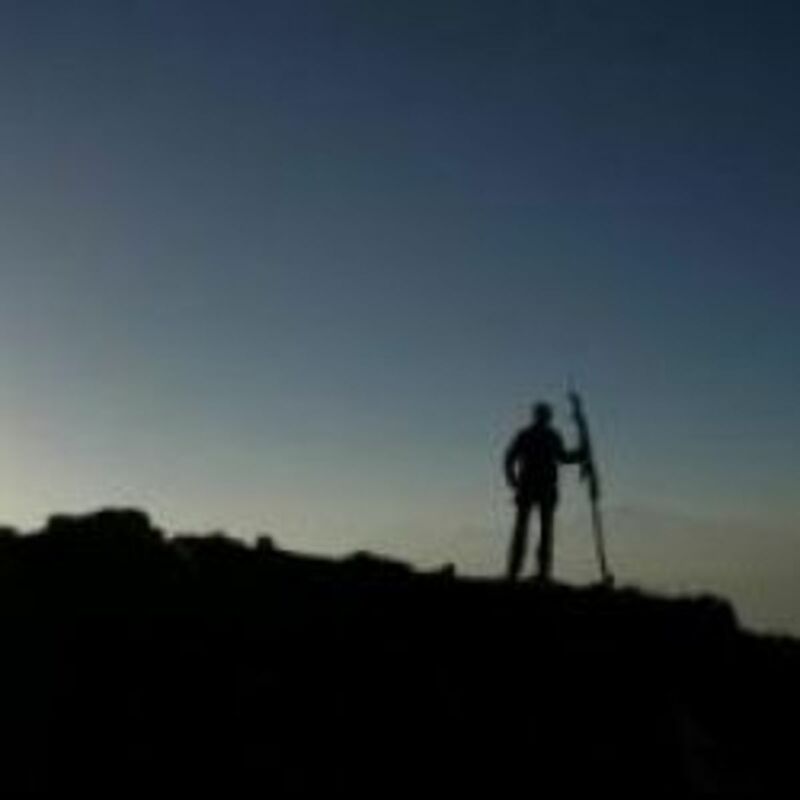 I've always enjoyed your landscape and landmark photos. But these wildlife photos are just amazing! Wow. I just got back from Florida a few weeks ago, but plan to go back next year. I'll have to put this on my "must visit" list. Thanks for sharing all your beautiful work with us! Hi Linda. Thank you. We really enjoyed our time in the Vero Beach area and look forward to returning. It's a wonderful area to explore nature with numerous parks in addition to a beautiful beach. Have a great week. You've shared a very interesting article and some lovely photos, Bill. 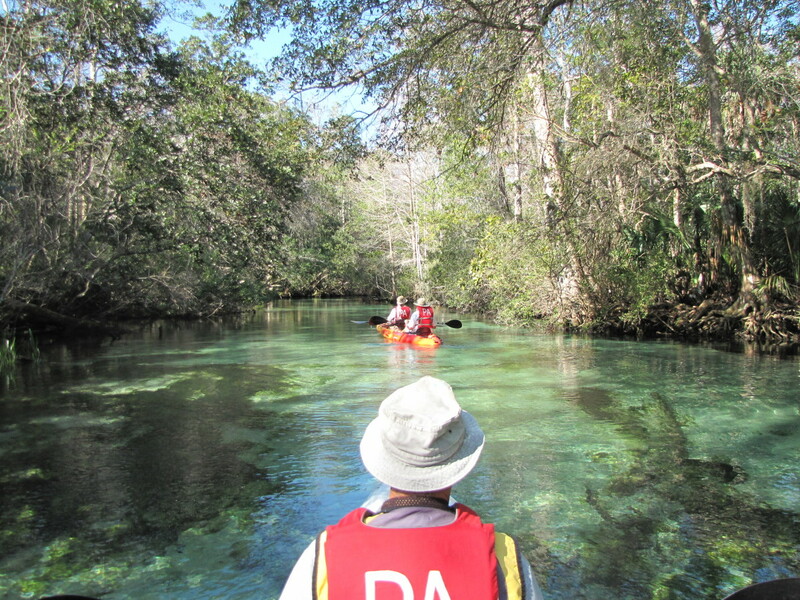 I hope I can explore the natural areas of Florida one day. That would be a wonderful trip. Hi Bill. This was a visit to a part of Florida that we had never visited before so it was all new to us. I would venture to say that having visited 38 states that you've seen some mighty interesting places? As always thank you for stopping by. Have an enjoyable Sunday. I've never been to Florida. I know I say that about a lot of places you write about, but I have been to 38 states, so it's not like I sit at home watching tv all my life. LOL Anyway, great job as always. Thanks for taking me along. Hi Flourish. It is a beautiful area and we really enjoyed our stay. Paul Kroegel is a hero in my book also. Can you imagine taking your little boat out to that island every day to protect the birds. I didn't write this in the article but when he was hired as the manager of Pelican Island he was paid $1 per day. Can you imagine risking your life for $1? I love discovering stories like this. The Vero Beach area is absolutely gorgeous and I am sorry to have missed this spot while I was there. You provided such an enticing review that I will have to return just for the wildlife. The man who protected the birds from harm is a great hero in my book.